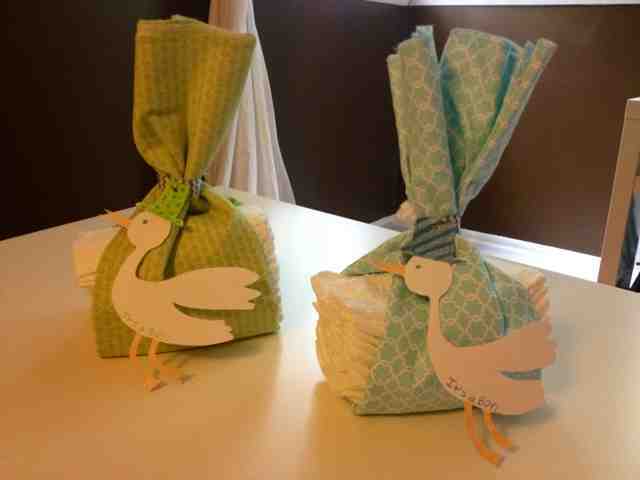 Nothing says Baby Shower like a Diaper Stork! I have made a few of these Diaper Storks for both baby showers and as gifts for new mothers ... if you have been following my blog, you know I have been going baby shower crazy lately! The idea falls along the same lines as a diaper cake or one of those more complex diaper tricycles, but a Diaper Stork is a bit quicker and easier to create and the final product is just as adorable! All you need to create a Diaper Stork is a receiving blanket, diapers, ribbon and a bit of creativity to create a paper stork. 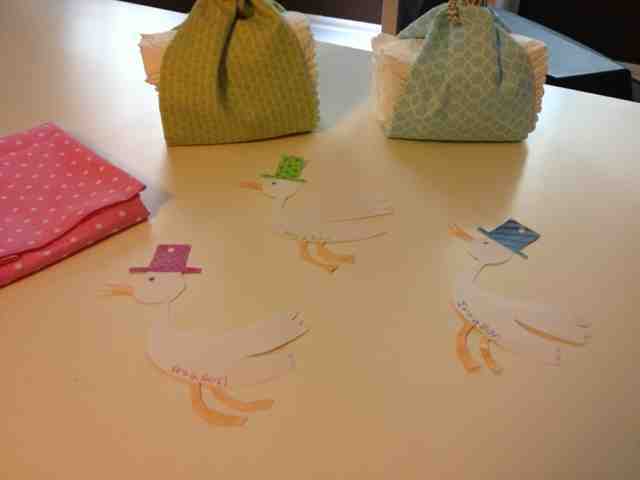 In this case, I was creating three Diaper Storks for upcoming showers. 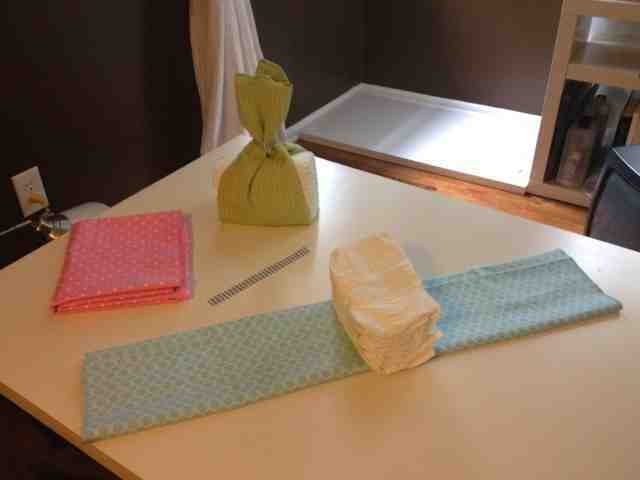 To begin, fold the receiving blanket just short of the width of the diapers. Place a stack of 10 diapers in the center of the blanket. I have also made a double-wide Diaper Stork by putting 2 stacks of 10 diapers next to each other in the center of the blanket. 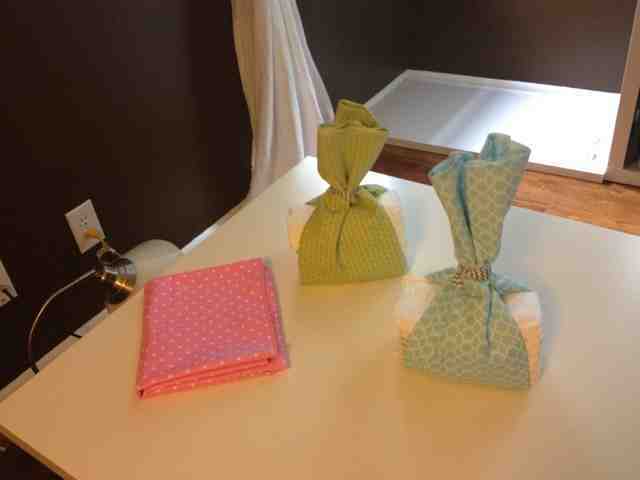 Then, gather the ends of the blanket and secure them with a ribbon. 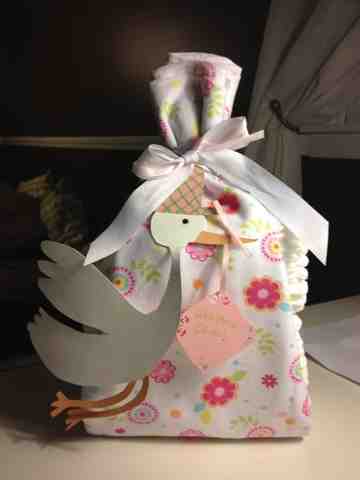 Create a stork out of cardstock. I prefer to hand draw my storks though you could also design the stork on the computer. Decorate the stork by either coloring or painting it. This is where you get to be creative - decorate as much or as little as you want. You could add a 3D eye or puffy paint to add dimension ... the possibilities are endless! In this case, I colored the storks in with colored pencils. I chose colors that complimented the colors of the receiving blankets and added a bit of pattern to the storks' top hats. Lastly, attach the stork to the bundle of diapers by punching a hole through the top hat and threading the ribbon through the hole. This is a simple project that won't break the bank. Plus, the time and creativity put into the personalized creation is sure to make the new mother feel special!